Mira is using Smore newsletters to spread the word online. __George Washington was the commander of the Continental Army in the American Revolution and the FIRST president of the U.S. He lived the years of 1732–1799. He became one of the most known people in the world for being the first president and a bunch of other things. We all know about him now because of his great achievements he has gained in his life. __Dinwiddie sent Washington back to the Ohio Country to protect an Ohio Company's crew constructing a fort at present-day Pittsburgh, Pennsylvania. However, before he reached the area, a French force drove out colonial traders and began construction of Fort Duquesne. The French responded by attacking and capturing Washington at Fort Necessity in July 1754. However, he was allowed to return with his troops to Virginia. Historian Joseph Ellis concludes that the episode demonstrated Washington's bravery, initiative, inexperience and impetuosity. These events had international consequences. Dinwiddie rewarded Washington in 1755 with a commission as "Colonel of the Virginia Regiment and Commander in Chief of all forces now raised in the defense of His Majesty's Colony" and gave him the task of defending Virginia's frontier. __Washington opposed the 1765 Stamp Act, the first direct tax on the colonies, and began taking a leading role in the growing colonial resistance when protests against the Townshend Acts (enacted in 1767) became widespread. After the Battles of Lexington and Concord near Boston in April 1775, the colonies went to war. 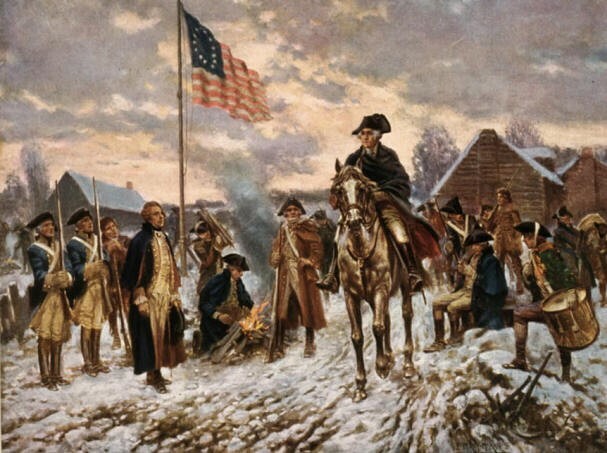 Washington appeared at the Second Continental Congress in a military uniform, signaling that he was prepared for war. Washington had three roles during the war. In 1775–77, and again in 1781 he led his men against the main British forces. Although highly disparaging toward most of the Patriots, British newspapers routinely praised Washington's personal character and qualities as a military commander. __Washington was persuaded to attend the Constitutional Convention in Philadelphia in the summer of 1787, and was unanimously elected president of the Convention. 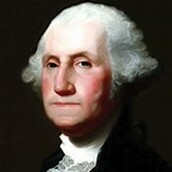 he delegates designed the presidency with Washington in mind, and allowed him to define the office once elected. __George Washington was strapped for cash during his presidency. George Washington established the cabinet of advisors. Washington signed into law the first copyright law. 0n May 31, 1790, President Washington signed the Copyright Act of 1790 into law. The first Thanksgiving Proclamation was issued by President Washington to be known as a U.S. holiday. Days of thanksgiving were celebrated since the beginning of European settlement in North America. In 1789, President Washington formalized the holiday by issuing a proclamation designating November 26 as a national day of thanksgiving. Washington’s Farewell Address has continued to have resonance over time. Washington’s Farewell Address, which warned against “the baneful effects of the Spirit of Party,” encouraged a focus on education and morality, cautioned against sectionalism within the nation, and admonished against entangling foreign alliances, has continued to have influence over American culture and political debates long past when it was first published.